I don't know a working mom who doesn't struggle to keep all the work/home spinning plates in the air. Even the most seasoned "jugglers" seem like they're just a sneeze or blink away from having it all come crashing down. Possibly because the challenge is so difficult, it's become quite apparent to me that there is no one way to do it. I guess if there were, we'd all just do that, right? While the challenge is a common one, there are so many variable factors that are unique to each person's situation. These include that mom's personality, interests, and strengths, her family's values, the ages of her children, hierarchical level at her job, how much of a village does she have to provide additional support, etc. Given the breadth of circumstance variation, it should come as no surprise that these women seem to approach the work-life balance challenge using very different methods. As an entrepreneur, working mom, and corporate trainer (who teaches time management among other topics), I've become intrigued (if not slightly obsessed) with analyzing how other working moms "do it." I was so interested that I launched my own Working Moms' Work Life Balance Survey in 2015 and got feedback from more than 500 working moms on how they manage to strike their own version of balance (or harmony as one respondent put it). The 2015 Working Moms' Work Life Balance Report also underscored the reality that working women have very different attitudes and philosophies on the fundamental concept of work-life balance. Obviously, working women are very individualistic and vary quite a bit in these two crucial areas. 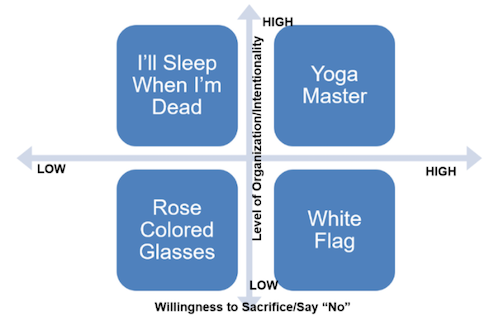 That variation is what determines their "work-life balance personality." Well, this one is pretty self- explanatory. This personality is the type A mom who is running at 110% capacity at all times. If she finds herself somehow sitting casually on her bed at the end of the day, she becomes uncomfortable and grabs a load of laundry to fold - because who wants to waste 20 minutes doing "nothing," right? At work, she's equally determined to give it her all and refuses to alter her professional goals based on home life demands. Like virtually all moms, she is very well-intentioned and absolutely determined to do it all - "failure" is not an option! She might be the mom who volunteers to be class mom and sends out a pivot table that she created to help organize all the classroom trips/activities and related logistics. Every class needs at least couple of these moms, right? The downside, clearly, is that she's burning the candle at both ends and may be unknowingly just an unexpected flat tire away from a nervous breakdown. She wears an "S" on her chest very proudly and wants acknowledgment as the chupacabra mom who gets more done before 10 AM than most do all day. She thinks boundaries are for wimps and seems to pride herself on having the longest "to-do" list of them all! Schedule relaxation appointments - decide how you want to unwind and schedule a recurring "relaxation appointment" (just as important as another item on your to-do list). Each month review the last month's calendar and pick at least 3 activities you could have declined, delegated, or outsourced and do that instead when those same type activities arise next month! Write a list of your top 3 priorities at work and home and post it in a visible place. As you get requests, consult the list to ensure you're committing to activities that advance your priorities. This personality (as the name suggests) is living in a bit of a fairy tale. She's taking on tasks left and right, but unfortunately, many of them are falling through the cracks! She doesn't quite know how to say "no," and it's impacting her at work and home. She's severely behind on her emails so if you need her, calling or texting is a better option. She wants to do it all, but she just doesn't have the organization gene that some other moms seem to have. Because she occasionally has significant blunders (e.g. kids miss out on the camp they were promised because she procrastinated on registering or missing a project deadline at work because she was distracted the week prior with family activities), she becomes periodically overwhelmed and doesn't understand why. She often works on tasks as they come (without any overall scheduling or prioritization) because she wants to say "yes" to everything, but she will often shift gears to start working on a new request not realizing a few days later that she never completed the previous one. She also may have the "disease to please" in that many tasks she takes on may not be ones she specifically prioritized but instead ones that were just "added to her plate" by others. This mom wants to "do it all" but doesn't have the organizational skills or deliberate approach to get it all done. She has a bit of unconscious incompetence in that she may think things are going great but periodically gets blindsided with the reality that she neglects certain tasks. Of the four types this one can be the most stressed and dissatisfied because they aren't accomplishing as much as the I'll Sleep When I'm Dead Type, but they're spending about the same amount of time running around like a crazy person trying to check off boxes. This mom is also more stressed because she doesn't really know why it's not working. Because she's not very intentional with mapping out her day or proactively determining her priorities, she walks through life in a very reactive way - wondering at the end of the day why so many things aren't getting done. This can unfortunately leave her feeling like a "failure" at the end of the day because she wasn't able to check all of her boxes. Hire a professional organizer to help you declutter home/home office! Don't commit to requests in the moment. Develop a quota for voluntary activities (at school/work) - maybe 2 hours/month and hold yourself to that quota. Develop a personal organization system - whether it's an online application or a lab notebook - and consistently use it to track tasks. Document EVERYTHING in one calendar to ensure your commitments are well documented. This mom has possibly "given up" or "checked out" a bit. She may have been one of the other types in years past then retreated to this one over time. This is the mom who used to really enjoy making crafts with the kids or thrived on conducting training sessions at work, but she hasn't done it in a really long time for some reason. She may have sacrificed to such an extreme that she has given up on areas that are truly important to her. This mom's "giving up" so to speak could be a knee jerk reaction to maybe having not done things perfectly in the past or feeling overextended previously and vowing never to make that same mistake so instead of trying, she just bows out. This could also be the new mom who is so intimidated at the thought of trying to get so much accomplished (between work and home) that they retreat to this position out of fear or intimidation. This mom sadly may be quite dissatisfied because they're indeed missing out on quite a lot. She may not realize that she has achieved "balance" by cutting into the "meat" of her life. She also may not be viewed very positively at work - not a "team player", not willing to "go the extra mile". She may even be resented by others as they seem least willing to volunteer. The lack of achievement/full engagement at both work and home plagues her, but she may not understand how to make it better. Write a list of your top 3 priorities at work and home and start 1 new recurring activity for both work and home that relates to your priorities. Proactively seek out feedback from other moms on what works for them to feel fully engaged at work and home without feeling overwhelmed. Ask those closest to you for feedback on how you're managing work and home life. Identify the types of activities/contributions that are most meaningful to them. This mom is the one who is absolutely Supermom in certain areas that are really important to her. Maybe on the home side her priorities are healthy eating, physical activity, family vacations, and chaperoning kids' field trips. However, she's also very willing and intentional about making strategic sacrifices by saying "no" to lower priority areas. This mom may be the one who has asked for a reduced work schedule or maybe started her own business to enable her to work a shorter, more flexible work week. Because she has sacrificed, she created an ability to say YES in a big way to her top priorities, and we're all in awe at what she accomplishes. In contrast to the I'll Sleep When I'm Dead Mom, she seems to be doing a lot but also have a zen quality about her (that the rest of us are desperately trying to achieve) because she's very selective in what she takes on and isn't afraid to say "no". She doesn't seem as stressed or bothered by not doing everything. She may not ever volunteer to be class mom or girl scout leader, but she pops up at school quite consistently and seems oddly balanced enough to really savor her contributions. She absolutely creates downtime by establishing firm boundaries at work and home. She effortlessly tells the team that she won't be available Friday afternoon because she's committed to a personal appointment. Because she set boundaries so early on with her boss and the team and she's been so consistent with respecting and enforcing them, it doesn't look like such a daunting task when she does it somehow. The key to her success seems to be prioritization, and she seems to be at peace with those items that get sacrificed on a day to day basis. She's developed the ability to focus on what she gets to do instead of obsession on what she doesn't. She has embraced outsourcing/delegating when it makes sense and prides herself on engaging her village regularly to not just help out but also provide her children exposure to other adult personalities. She doesn't seem to think that she has to "do it herself" for it to be done well. Ironically, she may not have as many tick marks on her "to do" list at the end of the day, but that's largely because she starts out with a shorter list (and by the way, she sleeps great). Remind yourself of your "yes" activities/achievements regularly. Carve out 1 day/month to focus on those "C" level tasks that tend to fall by the wayside. Dana Brownlee is an acclaimed keynote speaker, corporate trainer, and team development consultant. She is President of Professionalism Matters, Inc. a boutique professional development corporate training firm based in Atlanta, GA. She can be reached at [email protected]. Connect with her on Linked In @ www.linkedin.com/in/danabrownlee and Twitter @DanaBrownlee.